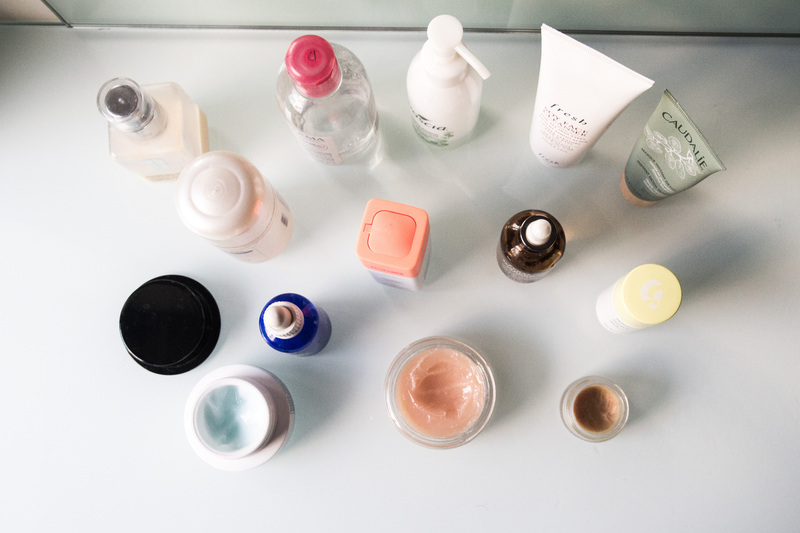 I started blogging purely about makeup back in 2012 but I think even on this blog, my interest in skincare has taken over makeup. 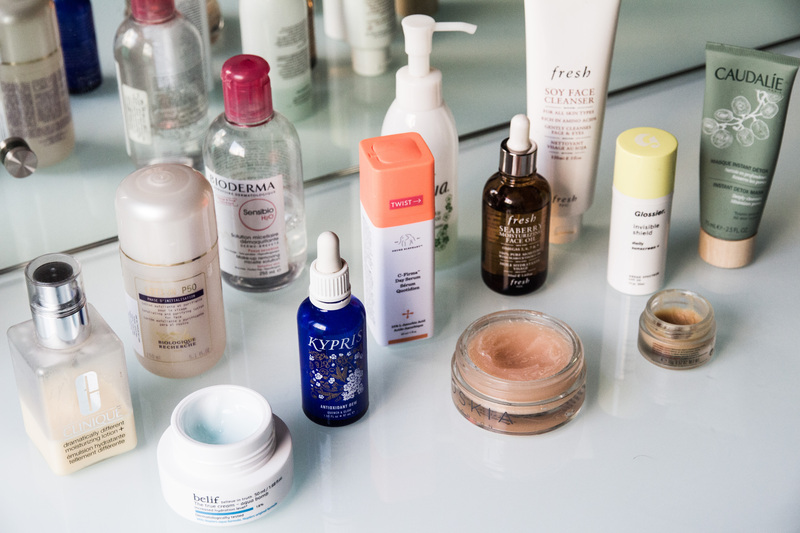 I have several posts dedicated to it but I noticed I haven’t posted a full skincare routine since 2016! Time to change that. Looking back, I’ve definitely pared down my routine by getting rid of a few steps that didn’t really make a difference. All of these products together really work well for me. 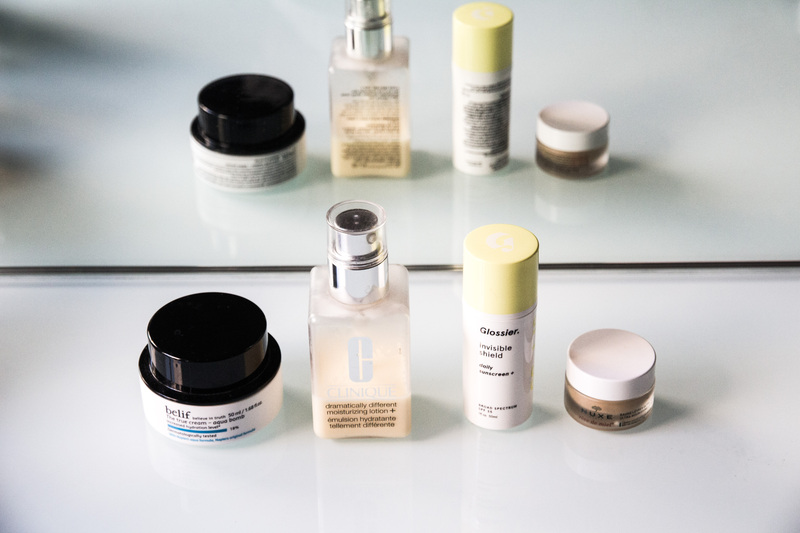 I’ve decided to focus on a winter routine because in the summer and humid weather, my products and preferences do change. I’ll probably do an updated routine later in the year to cover that as well. I know this post isn’t very detailed when it comes to ingredients. I mainly wanted to focus on how I use them together and make them work for me. Things to know, I have dry skin and with skincare products, my general preference is for the formula to be lightweight and fragrance free. I don’t get breakouts very often but it’s usually around my chin at that time of the month. Does this need an introduction? I’ve stuck with it since I first used many years ago. I tend to only use this when I have more makeup on. 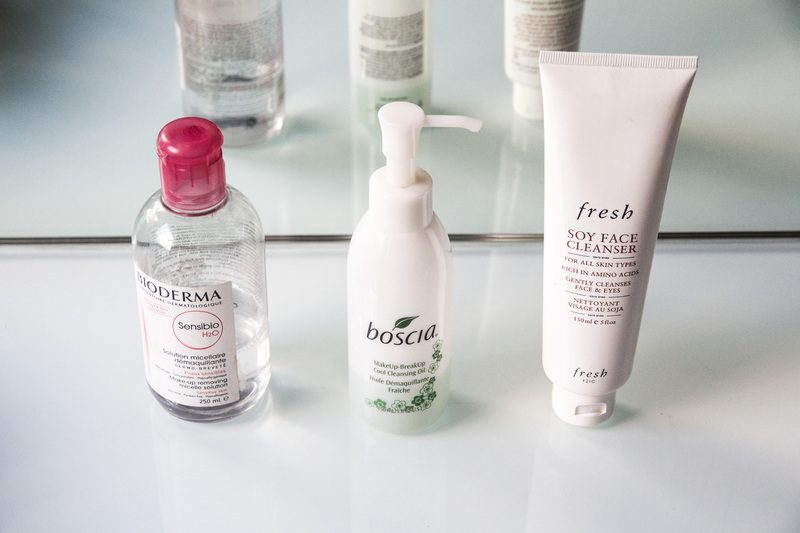 Typically, I find the other two cleansers to be enough to do the job. But if I’m wearing a liquid lipstick, full foundation etc then I prefer removing the bulk of it with Bioderma first. I also go over my waterline with this over a cotton bud. 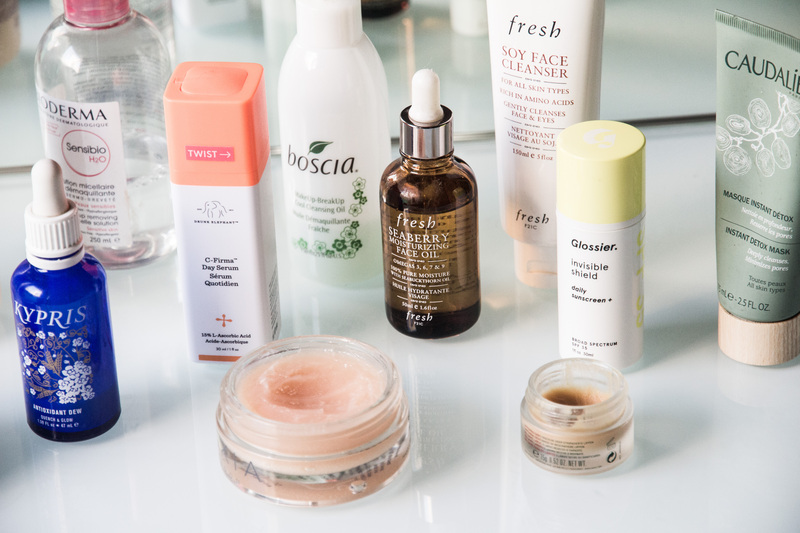 The biggest plus for me is that it’s so gentle on my eyes, I’ve never had any sort of irritation with this. I haven’t tried the Garnier or Simple dupes yet though. I think I’ll be sticking to this for a long time. This cleansing oil is a first for me and I completely get the hype. It’s a very light and dry oil which melts the makeup with ease and again, doesn’t bother my eyes at all! I haven’t noticed any cooling effects as the name suggests but it’s one of the best oils I’ve tried. Although I never travel with this, it does come with that stopper to disarm the pump. I love it when brands include little touches like that. If I compare it to my other favourite cleansing oil, the one from Tatcha, I find the oil to be more dry and not as silky as Tatcha. But other than that, they both take off makeup with ease. Boscia is notably cheaper as well. I usually need two pumps of this for my face and neck. It breaks down mascara, liner and foundation very easily. I’ve read a lot about this on other blogs but it was only after trying out a sample that I decided to purchase this. I love the cucumber scent, that instantly puts me in a relaxed and refreshed mood. It feels cool on the skin when applied, very soothing as well (much like applying aloe vera) and it’s so great to wake yourself up with this in the morning! I always need a giant cup of strong tea as well to get me moving. The texture of this cleanser is a gel which does lather up a bit. However, it isn’t drying in the slightest. My skin just feels really clean and soft after rinsing it off. I also like the Glossier Milky Jelly cleanser which functions similarly without the foaming component. I can’t count how many times I’ve raved about this! I know it has a cult around it and I feel strangely happy to be a part of it. It’s like our love for smelly stinging potions binds us together! I’ve been using Lotion P50 for around 3-4 years now and it’s always been in my routine. Over the last six months I felt like I didn’t really need daily exfoliation, so I now use this every other day unless I have a breakout. This is really effective in healing breakouts, keeping my skin smooth. In general, it keeps my skin in check. In regular use, this doesn’t sting but if I use this after a gap of many days, it does sting for a couple of seconds. This is a nice indicator for me that my skin is well behaved. If you have very dry areas, this will sting more in that region. I use my Shiseido cotton pad for patting this over my skin (as opposed to swiping) and I think that’s the prescribed method of using this. This is another holy grail product for me! This is my third or fourth bottle and I highly recommend this for a well formulated Vitamin C serum. This helped lighten a lot of my acne scars that had developed over the years and general pigmentation. I initially purchased this because the Skinceuticals serum is way too pricey but in the future I do want to try it out for comparison. I used to use this in the morning but I switched it to my evening routine to get more regular use. I found myself skipping this often when I was in a rush. I do find this to be a bit tacky at times, but that usually means I’ve applied a little too much. It does have a slight tint that develops over a few months, which is also why I prefer using this in the evening. However, after using it for so long, I feel like the effects aren’t as prominent as before which is my I won’t be repurchasing this right away unless I feel I need it. I will also run out of my Lotion P50 soon and I might try the Biologique Recherche Lotion P50 PIGM 400 version which targets pigmentation as well. This was on my wishlist for so long and I’m so glad I bought it! I already bought two backups because I can’t imagine my routine without it now! Antioxidant Dew is a great serum for hydration and works equally well as a moisturizer on those humid days. It has a very light milky texture that sinks in so quickly! It’s light enough to be used when my skin is normal or the weather is humid. It can also be layered multiple times in drier months till your skin feels quenched. I’ll be honest, I’m not entirely well researched about the ingredients for this product but I haven’t broken out or had any issues since I started using this. I used this up in 5 months and I can see this being a staple in my routine for a long time. On rushed mornings I may skip moisturizer and a bunch of other things but never this! Also, the gorgeous glass bottle design makes this very pretty to look at. Total hours wasted admiring it comes close 448. I stayed away from facial oils in the summer this year but I had to bring it back for winter. I picked this up earlier in the year and I’m glad to finally put it to use! I’ve only heard good things about this oil and after loving the Fresh Soy cleanser, I wanted to try more from the brand. It contains Sea Buckthorn oil and Omega fatty acids which makes this packed with antioxidants. 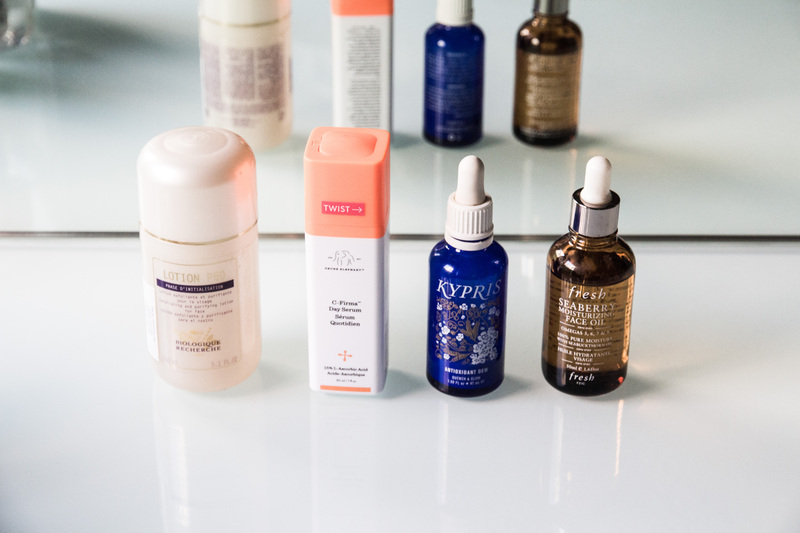 I particularly love layering this and the Kypris serum after using my vitamin C serum. It’s not a very thick oil, but I find Sunday Riley Juno to be lighter. I usually only need 2-3 drops to cover my face and neck. It does take a while to massage it in. I still love it though and would repurchase it in future if I didn’t have a couple other oils in my wishlist. This going to last me for a very long time though as I tend to go through oils at a snail’s pace. Be prepared to see this in a lot of future routines! I’m been through a phase of using more high end “fancy” moisturisers but I’ve realized I just like very basic light ones. It’s light and absorbs easily, it could suit any type of skin except maybe oily. I also love that this comes in a pump. It’s fragrance free and that’s pretty much all I have to say about it. A lighter moisturizer I like using is the Belif Aqua Bomb which is a gel formulation! It’s so cooling and I need a really tiny amount. It sinks in quickly if you’ve used the right amount, it can have bit of a sheen if I apply too much. It’s very lightweight, more so than any other moisturizer I’ve used before. It does have an artificial fragrance that I’m not very fond off. I know it’s not the first transparent sunscreen produced but it is the first one I’ve tried. Overall, I find this to be a good day time sunscreen if you’re not exposed for too long. If you’re at the beach or out all day, I suspect you’d want something higher. It is a bit tricky to know how much I’m supposed to use. It’s a soft gel kind of texture with granules. It’s feels very seamless when you apply it though. Again, love that this comes in a pump but it’s also hard to tell how much is left. I have a feeling I’ll be running out soon. 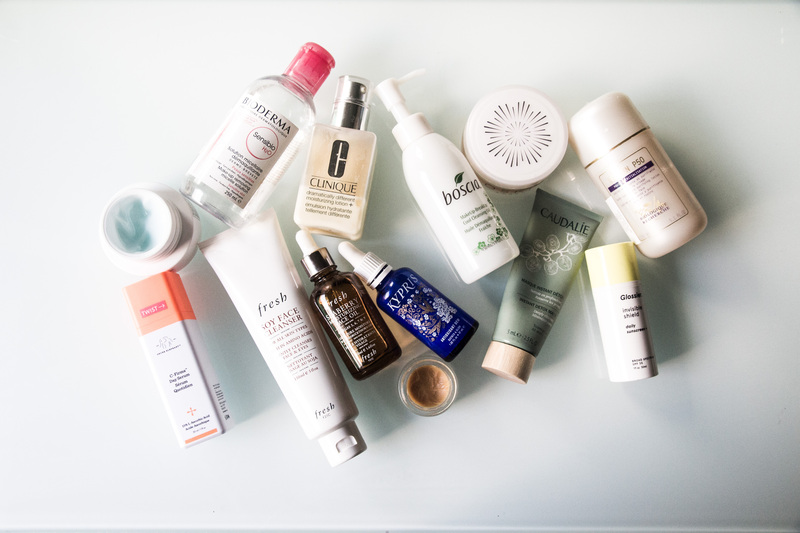 It’s not something I’d repurchase right away, getting my hands on Glossier isn’t very convenient and I love the Shiseido sunscreen just as much. I feel like I’m just repeating so many products but when I truly love something, I tend to stick to it. I find this Nuxe lip balm to be the most unique of all I’ve tried so far. It’s a bit gritty at times, thick, very soothing for irritated lips (I get that from time to time) and lastly, has a matte-ish finish! As something who hates the very glossy look that lip balms give, I really appreciate this for it’s finish and texture. If you’re snacking or drinking, it’s not a balm that will have to be instantly reapplied. It can hold fort reasonably well. If you want a mask that just brightens your face and makes you look awake instantly, I really recommend this. It’s a mild exfoliating mask with pumpkin enezymes that turns from thick peach gel to white cream when massaged on the skin. I leave this on from anywhere between 15-30 mins and the result is incredible. I love using this before going out if I have the time to get ready. I try to use this twice a week but I usually only remember to use it once. I’m not too militant with my schedule. I find clay masks necessary but uncomfortable. This Caudalie mask is the most gentle and effective clay mask I’ve tried! It doesn’t dry and pull my skin to the point that it hurts. The mask itself is very creamy and takes a while to dry completely which is a more comfortable experience rather than drying quickly and then waiting 10 more minutes in agony. It doesn’t have a discernible scent which is why i prefer this to my Aesop mask (though I like that a lot too and I have repurchased it). I would highly recommend this for people with dry skin. That concludes my routine! Let me know your new finds and if there’s anything you think I might like!